The Fourth Industrial Revolution could potentially be a rough time for HR professionals in managing which human capital stays or goes in the future. The saying, “Forewarned is Forearmed,” applies to everyone in this scenario. 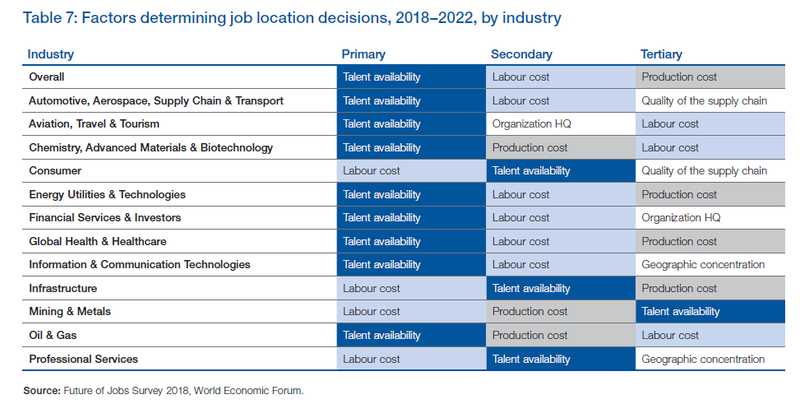 After reading the World Economic Forum’s report, ‘The Future of Jobs 2018,’ we foresee a few options for any company to prevent negative outcomes. Every industry is moving forward at some rate. Keep an ear to the ground and know which way your industry is going. Those in the know will be able to use educated decision making to react early, and save the business and many jobs. Get the whole team on board. What are they hearing about the future of your industry? What trends will impact on their ability to do their jobs? Do they know what skills they have, or need to be relevant in the future? How can they be part of the revolution? You never know where an innovative idea may come from. Encouraging everyone on your team to think differently could push your business forward faster than your competitors. Create a learning environment in your workplace. A large percentage of respondents to the WEF survey stated that internal departments will be preferred to train staff. If you get this implemented early, it could save you money. 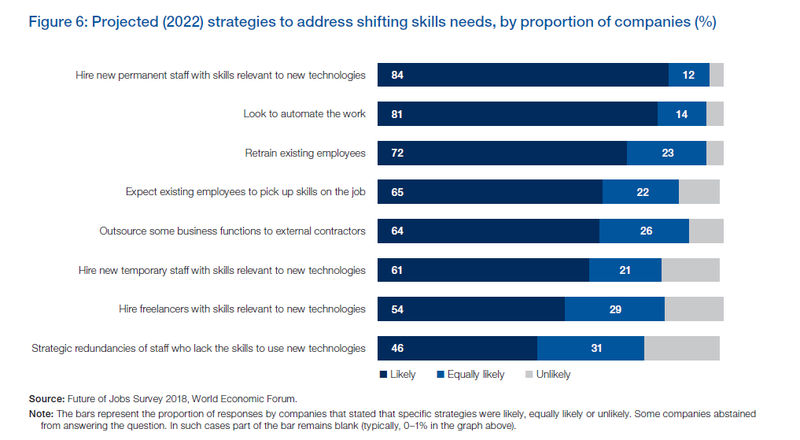 65% of respondents expect employees to pick up skills while on the job. You allow your employees to be aware of the need to acquire these skills when you share your future plans. Include everyone in the process. Encourage your team to identify where they would like to fit in and let them develop themselves into that role. At some point you may need to face the fact that if you don’t change, the market will force you to change. As much as you may not want to, making some staff redundant at the expense of technology could keep your business alive and pay other salaries. You might also be making space for new employees with new skills. Prepare for restructuring or re-tooling if necessary. Also, keep your staff prepared. According to the ‘Future of Jobs Report 2018,’ those most in need of re-skilling or up-skilling are least likely to receive it. Who do you plan on training and what can be done for the rest? The changes are not going to be overnight and an education program on personal development won’t go amiss. Nor will partnerships with your relevant SETA or education institutions. Bear in mind that the innovations now mean that there will be major re-tooling required. This has always been a barrier to moving a facility. Companies will see an opportunity to move, at the same time as retooling happens, in order to save cost. By this token invest in technology and skills of your team. It could be the difference between your facility being shut down and being upgraded.